Genre painting developed particularly in Holland in the seventeenth century. The most typical subjects were scenes of peasant life or drinking in taverns, and tended to be small in scale. 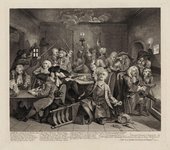 In Britain William Hogarth’s modern moral subjects were a special kind of genre, in their frankness and often biting social satire. Simpler genre painting emerged in later eighteenth century in for example George Morland, Henry Robert Morland and Francis Wheatley. Genre painting became hugely popular in the Victorian age following the success of the brilliantly skilled but deeply sentimental works of Sir David Wilkie. 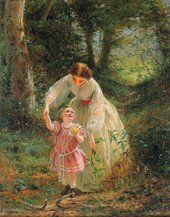 Towards the end of the nineteenth century a new focus for genre painting emerged. Artists wanted to capture the excitement and fleeting nature of the modern life they saw around them in fast-growing metropolises such as London and Paris. The simple and slightly sentimental genre scenes of the Victorian era were replaced by bustling street scenes and glittering cafe interiors captured by impressionist artists such as Auguste Renoir and Claude Monet. Reflections on the downsides of urbanisation also became a subject for artists. Camden Town Group painter Walter Sickert’s genre scenes painted early in the twentieth century include alienated couples in interiors – suggesting the loneliness people can feel in big cities. Confusingly, the word ‘genre’ is also used in art to describe the different types, or broad subjects, of painting. In the seventeenth century five types – or ‘genres’ – of painting were established, these were: history painting; portrait painting; landscape painting; genre painting (scenes of everyday life) and still life. These genres were seen by the art establishment as having varying levels of importance, with history painting (the painting of scenes from history, the bible or literature) as the most important genre, and still life (paintings of still objects) as the least important.